There is Kalam and there is Stanley… one gets to eat but not study, the other gets to go to a school but doesn’t get enough food. I Am Kalam and Stanley Ka Dabba are two brilliant films that sensitively portray issues like hunger, child labour and poverty. However, none go into the depressing documentary mode and the mood in both the films is uplifting, even if they leave your eyes moist. Directed by Nila Madhab Panda, I Am Kalam is a story about a poor Rajasthani boy named Chhotu who works at a dhaba (roadside food stall) and dreams of becoming a tie-wearing officer. He likes to study but has no means to fulfil his desire to go to a school. He is inspired by President APJ Abdul Kalam’s motivational words that there is nothing called destiny, your life is shaped by your karma (actions). He even names himself after the President and insists on being called Kalam. His learning continues as he interacts and learns from the foreigners who visit the dhaba. He also makes friends with a young prince from an erstwhile royal family who stays in the nearby palace turned heritage hotel. The filmmaker portrays the stark contrast between the two Indias we live in through these two kids; one who has everything and the other bereft of his basic rights. Without any doubt, the film belongs to the two child artistes, Harsh Mayar (Chhotu / Kalam) and Hussan Saad (Prince Ranvijay); their performance is natural and effortless. In comparison, the adult supporting cast looks amateurish. 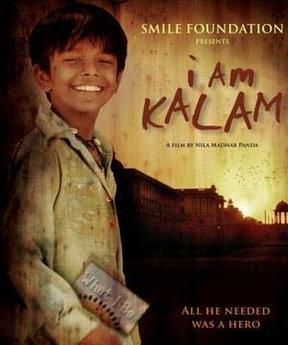 Do watch I Am Kalam for its simple story-telling and the big message. The other film, Stanley Ka Dabba shows how well the director, Amole Gupte understands kids and how filmmaking can be all heart. As the name suggests, the film is about a school kid, Stanley and his lunch box, actually his non-existent lunch box. While his classmates are kind and share their dabbas (lunch boxes) with him; his Hindi teacher, Verma Sir aka Khadoos (Amole) disapproves and eats their food himself. Filmed at an actual school during four hour workshops on Saturdays, Stanley Ka Dabba is a triumph of good story telling and simplicity. Partho Gupte is perfect as Stanley and the other kids who play his friends are equally endearing and at ease in front of the camera. Do catch the film on DVD if you missed it on big screen.